< List of music for Choir. Best Classical Tunes. A choir (or chorus) is a body of singers performing as a group, usually, but not always, singing in harmony. A modern choir consists usually of 4 sections of singers, who sing the Soprano Alto, Tenor and Bass parts. Choirs date back to ancient history, they are described by the Greek writer Homer in 850 BC. Before the renaissance, most choral singing was monophonic, that is all voices sang in unison. Church choirs consisted of men and boys only, as women were prohibited from participating by the church authorities. Polyphonic music for choirs with 4 or more parts reached a peak with Palestrina in the renaissance In the classical period there was a revival of baroque choral music, and town and village choirs sprang up to sing Handel's choral works, especially the Messiah. These choirs most definitely did include women! Such amateur choirs flourish today, singing a broad variety of music including Gilbert and Sullivan's operettas, popular musicals such as Oklahoma, as well as the traditional choral favourites such as the Bach and Handel oratorios. 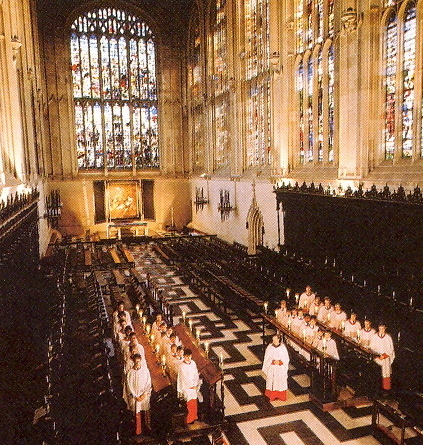 Music featuring the Choir. Audio is available for 35 tunes for this ensemble.